Welcome to my second ever Question and Answer post! Today I chose 10 questions from friends and (tried my best!) to answer them! Join me for a cup of coffee and enjoy! I will be writing a detailed post on how to organize children’s toys later this month, but here are some key ideas to get it started! 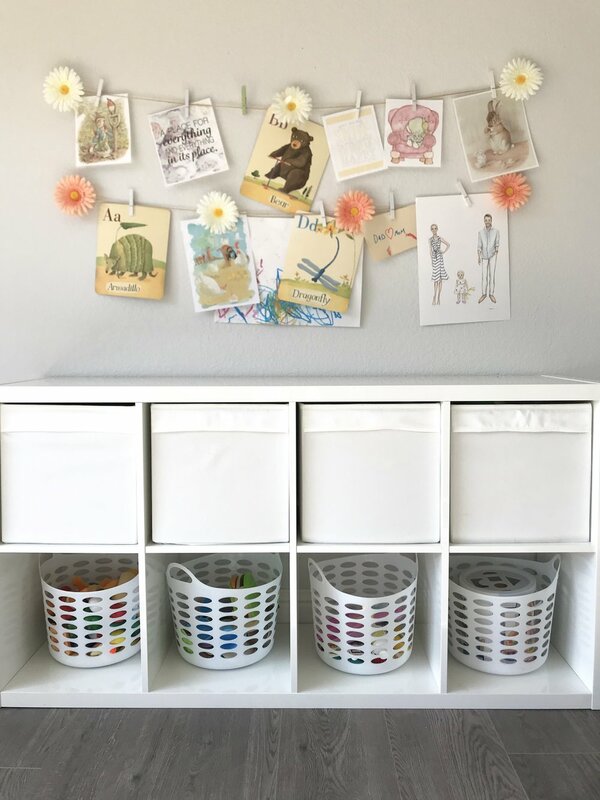 Choose storage that is easily accessible to children. Baskets, light containers and easy to move storage are perfect for kids of all ages. Keeping the storage solutions at their height (or close to it!) will help them learn to tidy up after themselves as well. Choose storage that are all the same color or color combinations, and then use labels to the front of each to define what items will go in them. Usually a toy room becomes too busy to the eye because there are so many colors and brand names screaming at you. Choosing one, or a specific combination, of storage boxes will let your eye rest in the space and reduce the visual clutter immensely. Group like items together - This is fantastic especially for kids that have many small toys! Cars stay with cars / car accessories. Dolls stay in the same bin or container as other dolls and their accessories. The best piece of furniture ive found to store toys in is the Ikea shelving unit. Combined with baskets (white for us!) that i picked up at the dollar store, it ensures all toys are out of the way but also easily accessible to Amelia. Thank you so much for your question, and hopefully I’ve given you a few ideas to implement and make things a bit easier for you! Sponge for washing everyday dishes - stays in its holder attached to the sink itself. I use Scotch brite non scratch sponge and it has a built in scrubber so I only need one tool for two jobs. Bottle brush - I affixed command hooks to my sink cupboard and hang my bottle brush when not in use (with the use of zip tags). This ensures it dries fully and is only accessed when necessary. All purpose scrubber - which I use to deep clean the sink, bath tub, bathroom sinks, showers etc is kept in my cleaning caddy in my cleaning closet along with all my other cleaners. Toilet scrubber - I have the same scrubber I use for my all purpose cleaning, but its designated the toilet scrubber (i’ve Labeled it with a sharpie lol). This also stays in my cleaning cupboard. I absolutely remember that episode of Friends! Although I totally understand how people may have one room in their home that they stash stuff to keep out of the way, we don’t actually have a room (or closet!) like that in our house. At one point we had some baby items in our basement that we were saving for my best friend after they had their first child, but other then that everything we own has a place in the house. That is beyond sweet and (kind of!) surprising! I don’t really take care of my nails! I wear nail polish once in a while (primarily in the summer months) but other then that I try to keep my nails bare in the winter so they can grow healthier. I keep them short because of Amelia and cleaning. The once piece of advice I can offer to protect your nails is always ALWAYS wear rubber gloves when doing dishes or cleaning around the house. I adopted this rule about 3 years ago and it made a huge difference not only to my nails but the health of my hands as well! I think when you have a full time job as well as home making and raising children, you really need to experiment to see what will work for you. For me, doing one or two small things a day ensures that the maintenance of my home is kept up at all times. But, it took me a while to find a schedule that works for us! And, inevitably this will change when Amelia gets older. My advice is this, write down what's important to you to tackle and then design a test schedule to try out for a week. Then, at the end of that week take a look at how you did and then make any changes you feel are necessary. I used to live in Toronto, Ontario! However we currently live in Northern California, outside San Francisco for my Husbands work. Before i was a SAHM I was a professional figure skating coach. My main joys (near the end of my career) was teaching very young children how to skate and foster a love of skating. Respond to as many messages and comments as you can. And, when your responding find out the persons name your responding to and try to use it. Find hashtags that you enjoy and engage with the community that uses them. Be genuinely intrested, concerned and passionate about your virtual friends. My first goal is to give content that will serve my community not about what I want to post all the time. I don't pay attention to SEO, Instagram or the Facebook algorithm or trying to beat it. I can't figure it out and it's a waste of energy to try. Be real and show people what you love and are passionate about. Listen to podcasts! My favorites are ‘Goal Digger podcast” by Jenna Kutcher, and “The Influencer Podcast” with Julie Solomon. Amazing free resources that I have learned a huge amount from! I’m pretty quick to get rid of receipts these days! The majority of bills come out online so I can always access them online if I needed to. I keep recipes for payments related to taxes (about 5 - 8 years, and they get filed with the taxes for that year) . I also keep recipes for any government issued paperwork, so recipes for proofs of citizenship, passports, green cards etc. (I’m always careful with those documents). If we purchase a large item I keep the recipes for about a year before shredding. Everything else gets shredded as soon as it comes in the house! Awesome questions I’ll do my best to answer them here, and then do a blog post about them separately later! Amelia’s schedule has changed at last 4 times since she was born, and that was primarily because of her nap schedule. The latest change was when she went down to one nap about 6 months ago and thats the schedule we’ve been with since! I’ve always worked my schedule around her nap schedule and it works really well for us! I have kept a handful of keepsakes that I gen unmanly believe will be cherished by not only Amelia, but our family for the rest of our lives. I’ve kept a self recorded ‘Berenstain Bears book that my grandparents recorded for Amelia , a beautiful bible my mother in law gave her, a baby blanket that someone knit her and a doll that was mine as a child. I think there will always be one or two items each year that really define that year, and those will be the times we choose to keep for Amelia when she's older. Everything else is donated to friends or charity! We have a HUGE amount of pictures of Amelia over the last two years! My Husband loves using Google to print books. Amazing quality but can be a bit more on the expensive side! I find Walgreens has a great open for printing picture books. We have 2 or 3 printed books and we give some to family members as well! Before Amelia was born I created a box, with folders for each year of school. As she goes through school we will save important pieces of that year in the file and then, when she's old enough, she can have the box and go through those memories. We may print off pictures, do a collage, use report cards, there is so many creative things you can do and the clutter is confined to one box! I hope I answered your questions!! I hope you enjoyed this edition of An Organized Life Q&A! I wish I could of responded to all of the questions I received on this blog post, but I will do my best to answer them individually if you emailed in! Never hesitate to shoot me a message or comment and ask a question, I'm always happy to help out when I can!